Indian software trade body Nasscom on Thursday dismissed widespread media reports of mass layoffs in the country’s hugely important information technology industry but warned that the sector must reinvent itself. IT outsourcing has long been one of India’s flagship industries but recent news reports have claimed that major companies, including Tech Mahindra and Wipro, are making thousands redundant due to increased automation. “The numbers being reported across different sources are incorrect and are not in line with the actual employment progression,” the National Association of Software and Services Companies said in a press release Thursday. “The industry continues to be a net hirer with talent acquisition continuing across sectors and remains one of the largest employers of the nation,” it added in the statement following a conference in New Delhi. Several Indian newspapers, including respected business dailies like “The Economic Times” and “Mint”, have reported major IT firms are in the process of gradually laying off thousands of staff, although the companies themselves are yet to comment on numbers. Nasscom claimed that 170,000 new jobs had been created in the recently ended financial year and predicted that up to three million new positions would be added by 2025, but conceded that there was a slowdown in the rate of hiring. It also called for employees to learn new skills to help companies’ keep up with demands for newer and more innovative technologies. “Going forward the focus for companies will be on skills and proficiency levels rather than scale, hence it is becoming imperative for employees (both current and potential) to skill themselves in domain specific requirements,” it said. Nasscom says that the IT outsourcing industry employs nearly four million Indians and saw revenues of around $154 billion. India has been popularly termed as the “back office” to the world as companies, largely in developed nations, subcontracted work to Indian firms, taking advantage of the country’s skilled English-speaking workforce. But there are concerns it is losing its sheen as companies move towards automation and seek newer technologies while there are also fears over US President Donald Trump’s curbs on H-1B visas, which allow aspiring Indian engineers to work in America. 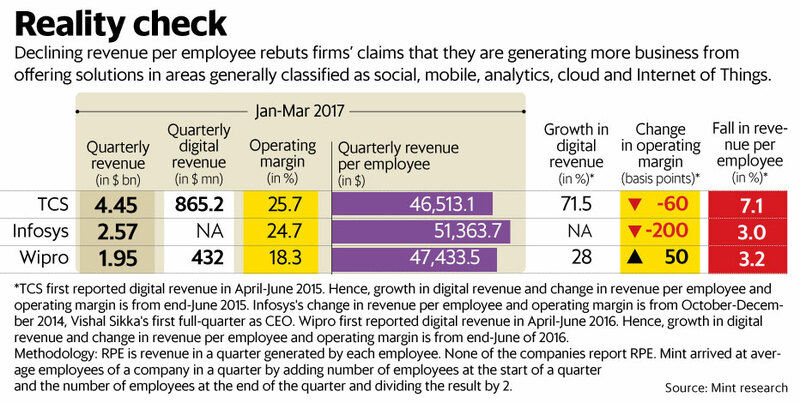 Tata Consultancy Services Ltd (TCS), Infosys Ltd and Wipro Ltd are grappling with falling revenue per employee and operating margins as Indian software firms struggle to generate revenue from new businesses such as data analytics even as demand for old services weakens. “Take for example a classic work like ERP (enterprise resource planning) upgrade to support a subscription billing model. Now that project to any IT services vendor worth their salt is being classified as digital revenue, is this really digital?” asked Ray Wang, founder of Constellation Research, a technology research and advisory firm. “We are moving in a world which is seeing a data explosion. How do you eventually make sense of large sets of data? A true test is how can I make my company better monetize this,” L&T Infotech Ltd CEO Sanjay Jalona, said in an interview earlier this month. “In some sense, there is an inflection point, where the pricing pressure for traditional business is still high. Some of our largest customers de-grew and so it impacted Mindtree. So despite the strong growth in digital, I cannot really tell you when this higher growth in digital will be able to offset the decline in traditional business,” said Mindtree Ltd CEO Rostow Ravanan. Satprnews.com have arranged the project in order to reveal the most captivating and informative data bringing the greatest use to the readers. Our mission is to take off the blanket and show all the benefits of IT outsourcing that Ukraine can offer to both national and foreign clients. The website is being built in a way any user can find everything necessary helping to choose Ukraine as its priority for doing business with. Different topics coverage in the Blog provides an analysis of the main advantages and disadvantages of the country since there is a good pile of information already available. Another part is the IT Outsourcing Playbook which is a brief and structured outline of the main information about Ukraine and its current IT outsourcing potential. Playbook aims at providing the most significant and precise data that will not mislead the reader about the local IT environment. And, finally, an analytic Research on different IT outsourcing-related issues and trends can be ordered in case if you need more information about Ukraine or other CEE region countries. Moreover, the team is already working on new updates to the structure of the website. Ukraine and its IT arena are open to the world and invite new businesses to be established. If you don’t want to miss and keep tuned with the newest issues, visit our website http://outsourcingreview.org/?scr=rw and subscribe via email to receive our newsletters. The sourcing world is changing fast, embracing new technology and ideas while transforming business models. 2017 will be another twelve months of evolution in the industry. Sourcingfocus.com has been asking what people predict for the industry in 2017. “Organisations will be forced to think more radically about how they source services for their organisations. The blistering pace of technologically driven change means that the status quo that has been accepted for many years will now be challenged. The digital and automation revolution will continue to accelerate and impact more organisations in more significant ways. In practice this means long standing outsourcing arrangements changing – outsource to in-house, in-house to outsource, changes in 3rd party supplier – with a view to transforming the capability of organisations. Decision makers who in the past often extended contracts as the most risk averse choice will now need to bite the bullet and change to alternative suppliers. The will expose poor Exit planning and inadequate knowledge management processes and systems. For some organisations 2017 will be a year where that take off, for others it will be the year they start their terminal decline.” said Chris Halward, Global Standards Director of the Global Sourcing Association. With that in mind it may be time to upskill with a GSA workshop, you can find out more here. “2017 will continue to see an expansion of cloud and digital transformation initiatives. Many deals which might historically have been done as a form of outsourcing transaction will instead be recrafted as a cloud services arrangement” says Kit Burden of law firm DLA Piper. Movement towards the cloud and digital services will continue to transform not just business life but home life as well. The introduction of technologies that utilise the cloud into all aspects of our lives is on the rise with devices such as Amazon’s Alexa a key example. “Process standardisation through the cloud may be the single most important element for CFOs to put into action. The agility, dynamism and standardisation of cloud-based applications give companies the means to continually innovate, a competitive necessity in a business world that is constantly changing” says Andy Bottrill, Regional Vice President of BlackLine. Robotics and AI also feature heavily in predictions for the industry in 2017. “AI has gradually been creeping into the business landscape for a couple of years now. In 2017 there will be a noticeable shift towards a broader incorporation of the technology. The latest robots have the ability to learn how to complete multiple jobs, so they can be plugged in practically anywhere along the supply chain” says Wendy Kent, COO at Matrix. “The impact that Robotic Process Automation (RPA) will have on sourcing in 2017 should not be underestimated. According to intelligence firm, Research and Markets, the global RPA market is expected to reach $8.75 billion by 2024 (up from $0.183 billion in 2013), as companies increasingly scramble to take advantage of the enhanced accuracy, cost savings and scalability that RPA promises to deliver” notes Laurie Padua, Director of Technology and Operations Consulting, Alexander Mann Solutions. The GSA is running a ‘How to make RPA and AI work’ workshop in London on 22/02/2017. Click here to find out more. “Customer service has become an integral part of creating a successful brand and, as a result, many companies are placing customer experience at the heart of their business. This means that we have seen a shift in the relationship between brands and third-party BPOs. Rather than acting as an external service provider, BPOs now work closely with their customers to becoming a truly collaborative partner – one that can transform business processes and introduce innovation to better serve the company and customers. It is likely that this close collaboration will continue in 2017 and beyond.” says David Potter, SVP – Business Development at Firstsource Solutions. You can learn more on how to improve the customer experience your organisation offers at ‘Excellence in Customer Experience’. “Brexit has brought upon many uncertainties to European outsourcing, especially in relation to IT staff augmentation. Ultimately, it depends on what trade and immigration agreements are made between the UK and other EU countries. If they remain similar to the current EU agreements, then the level of skills provided by non-UK EU workers will remain broadly the same. However, if EU workers have to re-apply for visas or are limited in numbers, this is when we will see a massive skills gap develop” says Robert Barbus, Operations Director of Soitron Group on the future of Britain outside the EU. The coming year will be a time of uncertainty for the outsourcing industry, both within the U.S. and abroad. “It will be one of a handful of times that outsourcing will be affected by the political climate, says Rebecca Eisner, partner in Mayer Brown’s Technology Transactions practice. The new administration coming to power in the U.S. could have an impact on trade agreements, regulations, tax policies, visas and immigration–ultimately impacting the outsourcing industry, which continues to rely on the benefits of global labor arbitrage. Brexit only adds to industry anxiety in the U.K. and Europe.